Desert ecology - Study and teaching (Elementary) - Activity programs - Juvenile literature. Deserts - Study and teaching (Elementary) - Activity programs - Juvenile literature. 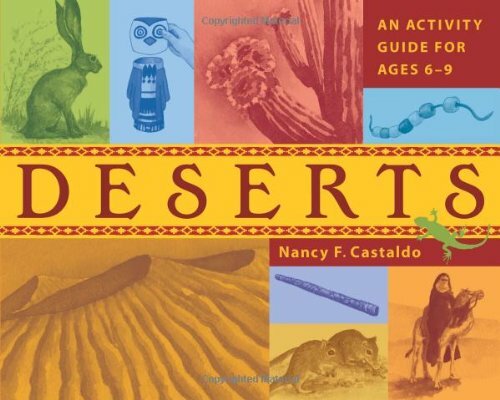 This activity guide introduces children to the wild and often misunderstood environment of the desert and the people and cultures that thrive in and around them. Information is included on all types of deserts-hot and dry, coastal, semiarid, and polar. Kids learn what defines a desert and the creative ways plants and animals have adapted to survive in harsh desert environments. Also discussed are urban sprawl and its effects on desert habitats and how children can help protect this delicate environment by conserving energy and reducing consumption of petroleum-based products. Engaging activities include drawing a petroglyph, making a coral snake bracelet, frying prickly pears, conducting a gerbil study, and making sand art.